And how do I get in on this design-y goodness? This is kinda idiotic. Why would you want a search bar there? In EVERY browser you have a search/omi bar anyway. So now you will have two search bar under each other. I like where the profile name/controls on the right are, that feels right. Seems like they should make a compact option for the new navbar (nav-dropdown?) though. Cram just a few more services on there. Well anyways it doesn't matter, Google's focus is to get people to install Chrome apps for their services, which makes them easily available on the new tab page of Chrome. TBH I've never used the left side of navbar. It's been all bookmarks/apps/extensions for me. And how is it possible use this new navigation bar? "A lot of users won't be able to switch from Google Search to Gmail, from Google Docs to Google Reader if the navigation links are no longer displayed"
Honestly, if they are that incompetent, they probably won't know how to use the services anyway. Just put your links in a bookmarks bar and don't have to worry about constant UI changes. Where is Google Voice in that drop-down menu? I'd like to see a more tightly integrated Google Contacts too! It's annoying to have to open gmail and then contacts. Why do we need this? I don't recall receiving any notification about the black bar. I didn't need it because it "just works". I am all for change if it is an improvement. That is why I use many/most of the Google services. If I wanted something shiny and new, I would get an iPhone! Tell us what this does better please. Will this be touch friendly? I like the buttons where they are because it works well on touch. So long as it is a hover action, that is impossible on any tablet. New Nav bar is cool. I'm surprised at this change - the black bar looks good and doesn't take too much space. What I'd really like to see is some ability to customize the services that show up on this tab. I'm tired of having the black bar include services that I will never use, and not including stuff that I use frequently. The services shown in the drop down box are selectable. I don't use sites or voice so I don't want it there. The search box on the top adjusts it's workings to the selected service. While in Docs it will act as a Docs search, while in contacts it act as a contacts search! Tom's idea of customization is great. What I like is that they include the icons so you don't need to read as currently. I was actually hoping they'd go further with the current black bar concept, rather than changing to a dropdown. I love the black bar, but I'd like it to be more customisable. I want it to rearrange itself with features that we use the most, and to have notifications for each service that we use, so that it's easy to see that there are 3 Reader posts and 2 emails waiting for you. I'd also like an official Google Chrome extension that allows you to access the bar nomatter where you are on the web. Dropdowns just make it more awkward, hiding potential notifications. I don't understand some Google design changes. On desktop sites, where we actually have a lot of screen real estate, they are considering hiding all the other services so that you need to click to show them. 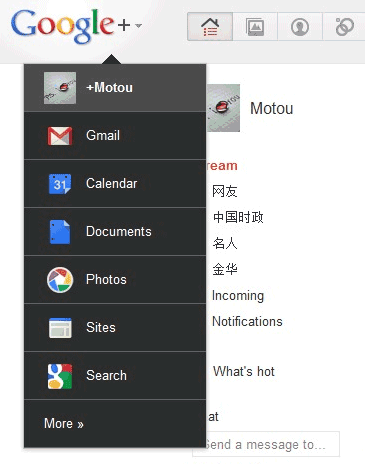 On the other hand, in the Ice Cream Sandwich build of Android, they're trying their best to keep menus and shortcuts on screen at all times in apps like Gmail, using up valuable screen space with their action bar - as if people are too stupid to know to hit a menu button to show a menu. Thank goodness for Firefox, Greasemonkey scripts and Stylish, etc. At some point ergonomics and familiarity trump aesthetics, which I might add, remain in the eye of the beholder. The recent onslaught of changes Google has introduced, services mothballed and what-have-you lead me believe Google has gone quite mad. I Loove the new display, but would also like to customise it and to have gmail reader and calendar integrated in the notification not just G+.. but I guess its coming .. they have to..
Actually - if you look at this it is not a new nav bar but the elimination of the nav bar. This simply mashes the missing controls from the nav bar into the already present header bar on Google+. If you look at your Google+ right now you will see this is just essentially pushing all of the right side content from the black nav bar down into the grey header bar. Then to give the Google property navigation back they put it in a dropdown on the Google+ logo on the left. A quick look at Gmail, Reader, and Calender shows they could easily take the same space saving approach on those as well. I didn't look at any others. The new bar is nice, but where's the option to stop it popping up automatically? Google have always done this with new features though (Chrome, google+ etc.) by shoving them in your face for a few weeks. It's expanded only on the homepage. Would someone post as to how you modify the Navigation Bar? I want to have Google Voice on my menu but do not see a way to modify the bar. The screen shot above shows the bar is completely different than my bar which leads me to believe this is an option. i really do not like this. I will switch back to yahoo if they keep it..
Any update about the navigation bar. How can I modify it?